Champaign is home to a diverse economy and its location near three major interstates makes it the perfect place for some of the nation’s largest manufacturers to take up residence. When workers come under harm due to accidents on the job, the Champaign-Urbana workers compensation attorneys of Rosenfeld Injury Lawyers LLC work tirelessly to ensure that those who have suffered injuries have access to all of the care and benefits that are guaranteed under state law. It is not uncommon for employers and their insurance companies to try to take advantage of workers who are not fully aware of their rights, and this is why you should always consult with an attorney following a work-related injury. If you or a family member was injured on the job and are in need of a Champaign, IL workers compensation lawyer, contact Rosenfeld Injury Lawyers LLC today for a free consultation. 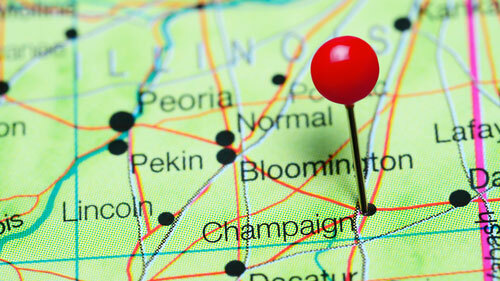 In addition to being a hotspot for technology, research and development, the Champaign area serves the needs of multiple Fortune 500 companies. Its proximity to I-57, I-74, I-72 and two major railroad carriers makes it an ideal location for production facilities and warehouses. It is for this reason that companies such as Kraft Foods, Fed Ex Ground, Caterpillar and John Deere have facilities located in the area. Other notable companies that have operations in Champaign include: Archer Daniels Midland, the United Parcel Service, Carle and PlastiPak Packaging. Industrial work comes with a defined risk of injury and most workers are aware of and accept these risks knowing that the law protects them in the event that they are injured. Our Champaign workers compensation lawyers provide education to injured workers about the rights that they may not have been aware of and help them explore every avenue available to recover the compensation they are entitled to. Regardless of whether you are injured while working in a factory or while doing office work, you are guaranteed workers’ compensation benefits during the duration of your recovery. It is undeniable that some occupations are just more dangerous than others, however. Following are some of the most dangerous professions and the dangers they present to workers on a daily basis. Transportation work— the transportation industry is one of the most deadly industries in the United States. Whether working in logistics loading and unloading trucks or working as a driver, you are subjected to serious risks. While only 4% of all accidents occur in this industry, 31% of all fatalities result from these injuries. Manufacturing and production— workers who make their livings in this industry are more likely to suffer debilitating injuries than those who work in other industries. Large machinery that consists of many moving parts is capable of causing life changing accidents in the blink of an eye and when workers’ limbs are caught between these parts, it usually results in permanent disability. Construction work and excavation— our country was and continues to be built on the backs of construction workers, who knowingly face dangers on a regular basis. The most common injuries sustained by construction workers are due to: overexertion, slips, trips, falls and being hit by falling objects. Workers may also be injured by heavy machinery when another worker does not operate the equipment in a safe manner or the machine malfunctions. Utility work— working around utility lines can prove extremely dangerous if proper safety precautions are not taken. Workers are often exposed to volatile and toxic materials on a regular basis and a minor error can have a major impact on multiple workers. One of the greatest misconceptions that our Champaign workers’ compensation lawyers have noticed is that claim disputes are between workers and their employers. Due to Illinois state employment laws, employers are required to carry insurance so that their workers are covered in the event of an accident. What this means for your claim is that it will ultimately be paid for by an insurer rather than your employer. Most of the problems that victims of workplace accidents encounter are the result of tactics used by insurance adjusters to deny payment or reduce the extent of liability, rather than the unwillingness of an employer to comply with the law. The propensity of insurance companies to avoid paying claims has driven 86% of all workers injured on the job to seek legal representation when filing their claims. Regardless of what you may be told by your employer or an insurance adjuster, it is important to remember that you are guaranteed the following benefits when you’ve been injured on the job. Full reimbursement of medical expenses, regardless of fault or choice of doctor. You have the right to seek medical treatment from whoever you want in order to ensure the quickest physical recovery possible and your employer is required to foot the bill. If you are threatened with a reduction in benefits or denial of payment for any reason, the law even allows you to seek additional compensation as a punitive measure. Continued payment of two thirds of your current income during the period in which you are unable to return to work. If your injuries permanently impact your ability to perform your duties, you are also entitled to a lump sum payment to cover the cost of your lost economic opportunities. The right to file a lawsuit against a negligent third-party, even if you have received workers’ compensation benefits. If you can prove that your employer was responsible for your accident and your workers’ compensation benefits are not sufficient to cover your expenses, you can seek additional compensation in a negligence lawsuit. Rosenfeld Injury Lawyers LLC takes a unique approach toward helping our clients move forward with their lives following a workplace accident. We recognize that you will need the best medical care possible to treat your injuries and have access to an extensive network of medical experts and specialists so that you can seek the care you deserve. While you are focusing on your physical recovery, our award winning lawyers can explore every avenue available to recover the compensation needed to cover the cost of your medical care and out of pocket expenses. We are also able to rely on our extended network of professionals for key testimony that can corroborate the value of your claim by accurately assessing the future cost of your medical needs in addition to the bills you’ve already incurred. Contact us today to arrange a free consultation with one of our Champaign-Urbana work comp attorneys to learn more about how we can help you throughout your recovery and ensure that you collect the maximum amount of compensation allowed by the law. If we are unable to help you recover the damages that you are entitled to, our services will be free of charge.